Power up with this fantastic 8000mAh capacity Nintendo SNES EU Contoller MimoPowerDeck Power Bank! 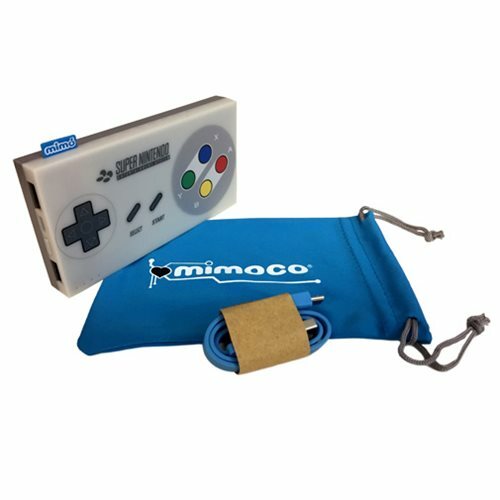 Designed to look like a Super Nintendo Entertainment System game controller, the rechargeable Super Nintendo 8000mAh MimoPowerDeck battery bank is compatible with iPhone, Android, tablets, and most other 5V USB devices. Features include a 4-level LED light charge indicator, dual USB outputs for charging two devices simultaneously, and pass-through charging. It measures about 4 3/4-nches x 2 1/2-inches and comes with a microUSB cable and a microfiber pouch.